I never thought I would be saying “I wish there was more running” after crossing the finish line in 5:31:32 (which is by far, my longest run ever). 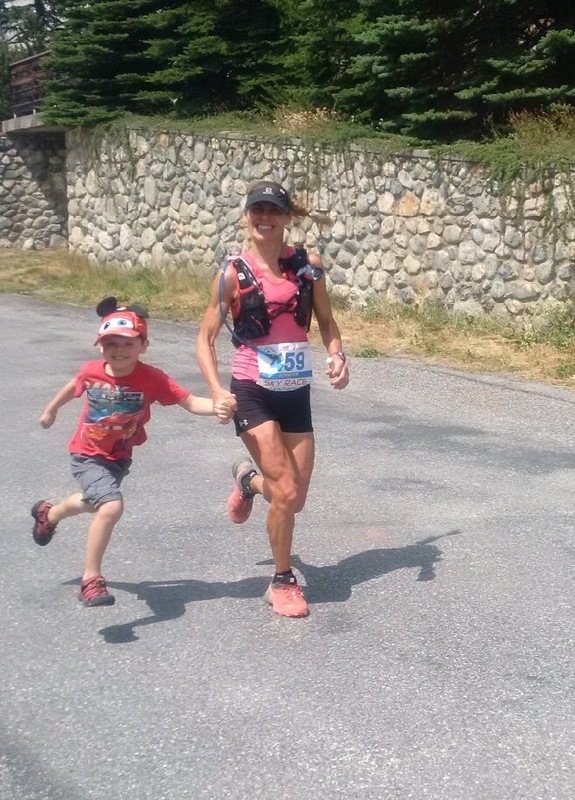 But then again, I wasn’t sure what to expect of this race other than it consisted of a 37K challenging course in the French Alps that took runners up 3 large ascents and down 3 grueling descents. But now that it’s over, I can easily say that this is by far one of my favorite races of all time, filled with many memorable moments. #1 The Views. 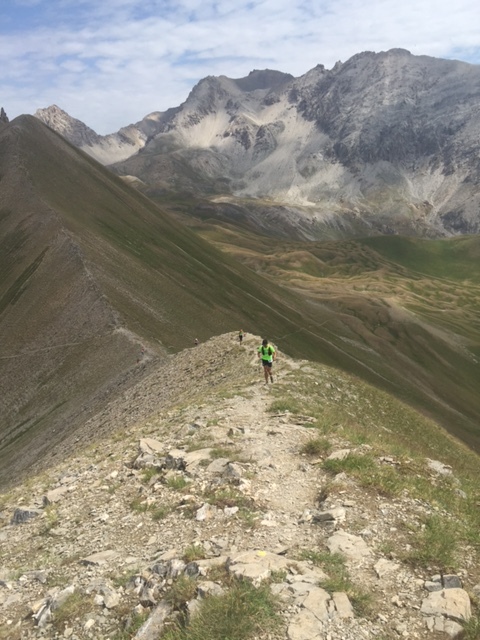 Hands down, this is by far one of the most stunning and picturesque races (check out this video, and once you get pass the cows you can see for yourself the views…although not sure why everyone here was walking, as I sure wasn’t). I couldn’t help but stop numerous times to look at my surroundings and to let it all soak in. 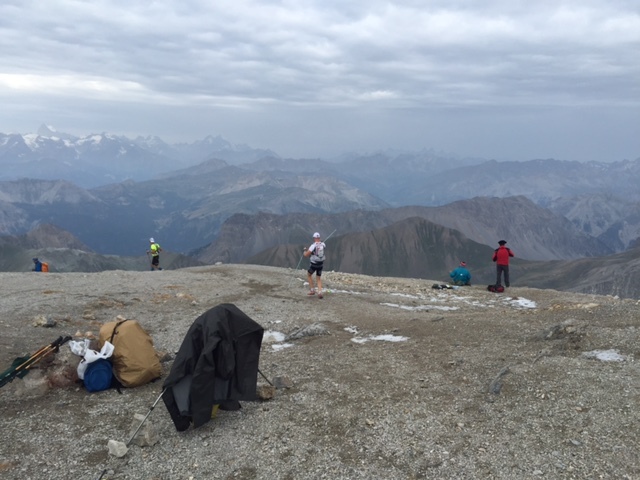 Upon reaching the first summit, a race official told me that I was only a few minutes behind the lead woman and that if I hurried, I could maybe catch her. He looked at me as though I had 2 heads when I said that I was in no rush and wanted to snap some pictures, and then kindly asked him to take my photo with the mountains in the background (too bad this picture didn’t turn out!). 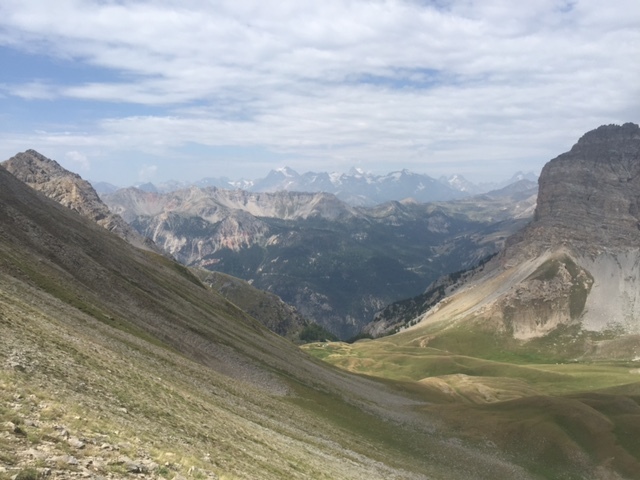 To my surprise, I also found the mountains to be a bit scary, especially when running along some of the ridges-one simple misstep and you could easily find yourself falling down either side of the mountain. Putting the fears aside (and maintaining constant focus on my footing), the scenery definitely exceeded my expectations. #2-New Challenges. The combination of the distance, the terrain, the altitude and the mountains made this an entirely new race experience. The first climb was 8K and I innocently assumed that I would be tackling it with a steady and gradual jog; it didn’t take me long to appreciate what the Sky series is all about and quickly switched to power walking and was able to maintain an aggressive pace and pass many runners. My advantage lasted only so long though, as “what goes up must come down”. As I was nearing the top of the first climb, which was extremely steep and very tricky terrain, I thought to myself “Thank god we don’t have to run down this side of the mountain”. All of a sudden, the lead males came zipping back down towards me. I’m not kidding when I say that I almost peed my pants out of fear, wondering how the hell I was going to do this without getting injured. I had never ran on this type of terrain before-it was a combination of sand, mud, rocks and gravel with nothing to hold on; once you fall, you might as well roll down to the bottom (check out a similar terrain with this video, although trust me when I say it does not do it justice). I soon learned why most of the runners carried poles with them! to Needless to say, I was very timid and slow, getting passed numerous times by other runners. Six kilometers later, I was at the bottom, and took a minute to remove my shoes and dump out the rocks that had accumulated inside. This game of cat and mouse with the runners went on for 2 more peaks. On 2 separate occasions I was asked by male runners “Pourquoi êtes vous tellement bonne à monter mais très lent à déscendres”? (translation: why are you so good at climbing but so bad at descending?). My response was “Parce que je suis Canadienne” (because I’m Canadian) only to have them respond “mais vous avez les Rockies, non?” (but you have the Rockies, no?). I took their comments as a compliment for being strong on the uphill but laughed at their level of proficiency with Canadian geography. Instructions given on the start line are not always in English; fortunately, I spoke French and was able to text my husband (who was running next) important details such as “follow pink on the way up, and yellow on the way down”). It’s not always easy to find your typical sport gels and products (or be able to understand the ingredients listed in a different language). The food provided at the aid stations may not be what you are accustomed too (sorry-sausages, cheese, ham and prunes is not what I was craving at the 22k mark). I also found it amusing that at about 12K into the race, I started talking to myself and other racers in French; this was a first! All these quirky differences just made the race that much more interesting! 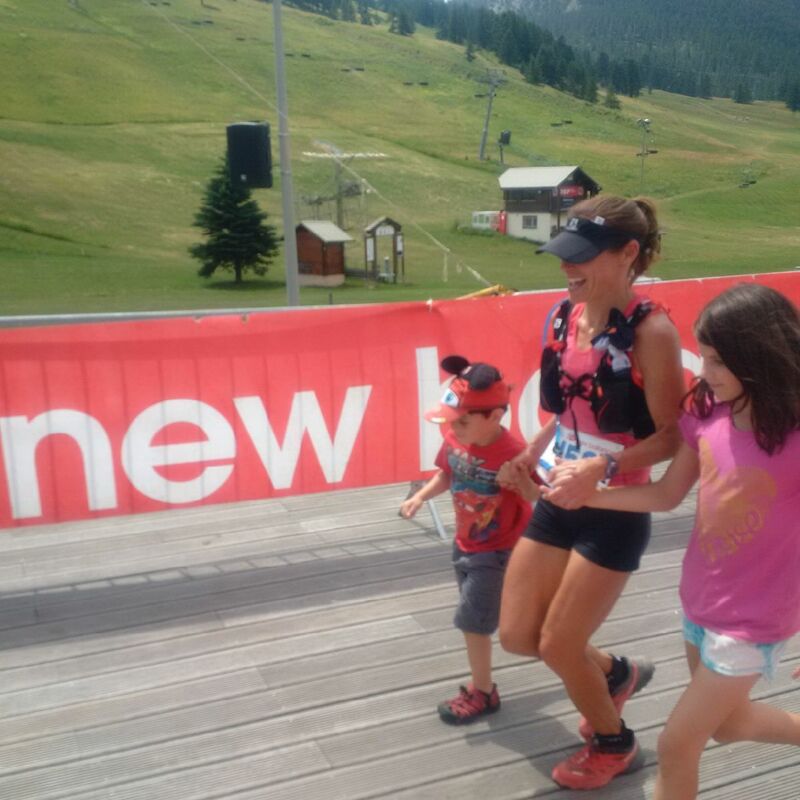 The icing on the cake for this race was being able to run the last km of the race with my children, and to find out that I was 2nd overall female and 26 overall. I didn’t go into this race with this expectation, and certainly did not approach it as a race, but I will gladly accept this accomplishment! There is so much more I could write about this amazing race. But perhaps it is best that I stop it here, and leave the rest up to your imagination. Or better yet, run it for yourself next year!